The issue of larger cruise ships such as those operated by Celebrity, Princess, Holland America and Crystal Cruises being substantially restricted from cruising to the Antarctic by the prohibition on carrying anything other than diesel fuel is now coming to the fore. One result is the loss of funding for the International Association of Antarctica Tour Operators, which is opening its annual general meeting in Torino tomorrow. A move will be discussed there to increase the present passenger fee to cover this shortfall. 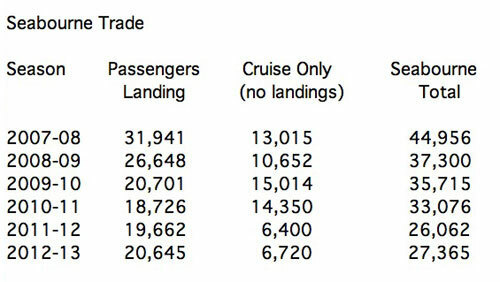 Passenger numbers are again forecast to drop for the 2010-11 season from 36,284 last year to 34,009. This compares to 44,958 in 2007-08 and 37,300 in 2008-09. In view of these passenger count changes, IAATO is seeking to increase its passenger fees, which are quite moderate compared to what has been charged in Alaska, for example. Financially, IAATO has been buffered from decreased passenger numbers over the past three seasons by increases that have already taken effect in 2007-08 and 2008-09, but that buffer is about to run out. The big hit will occur with the 2011-12 season, when the projected drop for cruise-only passengers will be from 14,350 to 6,400 passengers, well in excess of half. This loss of income equates to a drop from about $255,250 to about $96,000, resulting in a loss to IAATO income of about $100,000. As a result, IAATO has been forced to look at increasing fees again. Most members are generally prepared for an increase of $5 to $10 per head, an increase that should not affect members' competitiveness nor demand on the part of consumers. 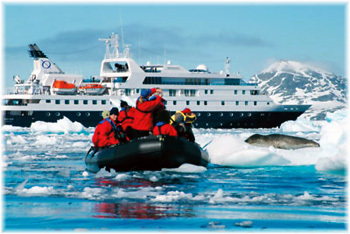 Any loss in demand in recent years can be put down more to the economic reason than anything else, the Antartic cruise for many being a once in a lifetime proposition that can almost always be put off until another year. Recent IAATO fee inceases have been from a $10 fee for all passengers in 2007-08, to $15 per head in 2008-09, then to $15 per head for cruise-only and $20 per head for landed passengers in 2009-10. In order to maintain IAATO as a strong organisation it has now been proposed to leave fees alone for the 2010-11 season but to raise them for 2011-12 and two proposals have been tabled. The first calls fof a $10 increase for landed passengers, to $30 per head, and a $7.50 increase for cruise-onlypassengers, to $22.50 in 2011-12. The second calls for a $6 increase for landed passengers in 2011-12 and another $4 in 2012-13, bringing the fee to $26 in 2011-12 and $30 in 2012-13, while cruise-only fees would rise $4 in 2011-12 and $3.50 in 2012-13, for a fee of $19 in 2011-12 and $22.50 in 2012-13. Results will be known shortly. * The Cruise Examiner is in the Mediterranean this week on a cruise and will report next week on the contribution of cruise tourism to the European economy.